Editorial staff allocate presented manuscripts to reviewers (PhD, DSc), based either on a line of scientific research, or on the subject of issues, the manuscript concerns. Reviewing period is up to 1 month. In case of manuscript being rejected or a revision recommended, it will be returned to author with corresponding recommendations. Manuscripts, revised in accordance with reviewer’s comments, and sent back to editors, will be registered as received anew, and all the corrections will be co-ordinated with the reviewer. If the author disagrees with reviewer’s opinion regarding his manuscript, the latter can be allocated to another specialist. After second negative review, manuscript is considered rejected by editors. Review procedure is open, i.e. review will contain reviewer’s name. 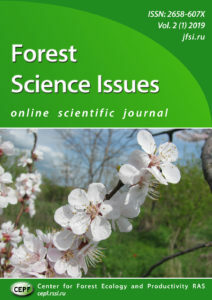 corresponding member of RAS ​ Lukina N.V.
FOREST SCIENCE ISSUES/ВОПРОСЫ ЛЕСНОЙ НАУКИ © 2019. All Rights Reserved.